We finally decided to take a little bit of honey from the one year old hive. So I extracted three frames and left the other five full frames for the bees. The three frames yielded just under 10 pounds of honey. Not too bad. 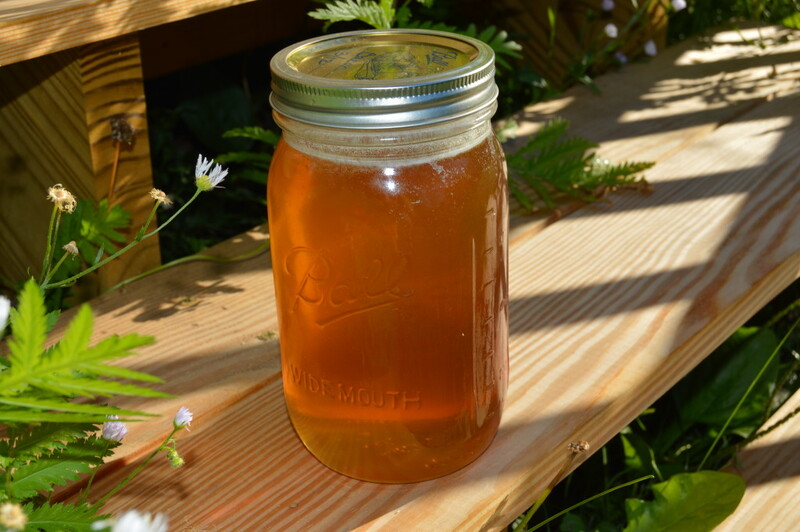 There are so many advantages to having your own raw honey to use. One of the main reasons we got bees is because my husband suffers from seasonal allergies. We have read that if you have just a little bit of local raw honey each day that it will help boost your immune system against those plants that you have an allergy to. This works because the bees feed from the same plants and therefore a small amount of the pollen, which is usually the culprit, is introduced to your system and you can build antibodies against them. I find this so amazing that God has provided what we need to take care of our issues. There are a couple of key elements that are important. First, the honey needs to be raw. If it is heated it damages the pollen in the honey and it will not work the same in your body. Second, the honey should be as local as possible to insure that it contains the pollen that are causing your allergic reactions. I recommend that you visit a local farmers market or Google for a local honey producer because I know not everyone can or wants to keep their own bees. We have made it through the first year of keeping bees with success and some downfalls. The biggest being that our first hive was so successful that it swarmed sometime in, we think, the middle of July. We were not home when it happened so totally missed the opportunity to capture the hive. What we first noticed is that there was not all that much activity at the hive. It wasn't even as busy as the new hive. There were so many days of clouds, wind and rain that it took a couple of weeks until we could actually open the hive and see what was going on. Well, there was honey, eight full frames but there was no young brood. There was a few very mature, almost ready to hatch, brood but no young stuff and we could not find a queen. I e-mailed my bee mentor with a bunch of questions. He said that yes the hive had likely swarmed and that I could requeen. I started calling places that might have queens for sale this late in the season. The lady at Backwoods Bee Farm in Windham, ME was so helpful. Since we have a second hive and they are raising brood very well she suggested that I could move one of the frames of brood into the other hive and see what happens. First she said that it would give the bees in the other hive something to do raising the brood. You see bees spend a lot of their time raising the next generation and if there is none to raise they get bored. She also said that there was a possibility that they have already raised a replacement queen and that it had not taken it mating flight so had not started laying eggs yet. If there was no new queen yet though the bees would build what is called supersedure or emergency queen cells and they would do it in three days. We checked the frame after 3 days and there were no emergency queen cells so we are hopeful that the hive has replaced their queen themselves. I am going to check the hive again at 6 days just to make sure there are no queen cells. If they are just now trying to raise another queen it is too late in the season and we will indeed need to get a new queen. The more I learn about our bees, and boy do I have a lot to learn, the more amazed I am by these creatures and their Creator. Their societal structure is one of total cooperation, when faced with a portion that leave, for whatever reason though usually space, they will raise a new queen for those that are left. As long as their is enough time in the season in our cold climate they will continue to raise the next generation and store honey to make it through the winter. It has been a wonderful adventure down the path of beekeeping and we feel that not only are we getting a wonderful product for our family but we are doing our part to keep this valuable pollinator alive and reproducing for the benefit of all. All content of this web page including the photographs are copyrighted by Northwoods Homesteader. Feel free to share any of the content as long as no profit is recognized. Please contact us if you have any questions.